This was an engineering test transmission to check that the new rig and aerial was working OK but also had three presenters, Rob James, Steve Day and Roger Hall doing a Saturday, 4-6pm broadcast. Rob James programme had a format of two-thirds oldies to third chart sound. An earlier test transmission was mentioned 10 weeks previously and listeners letters were read out but we have no further information at this time except that the station was broadcast as Radio Free Surrey. It is criminal to have removed all of the fantastic music in this MP3 but it is a crime not to do so. This was another engineering transmission and had the original line up of Rob, Steve and Roger. The music played got better and the links slicker. This was the first 'true' broadcast' and again featured Rob, Steve and Roger. I only have the Steve and Roger shows. Roger had a few cringy moments (actually every over) but at least the music was good! To listen using iTunes please click on the Subscribe button twice. This will automatically launch iTunes and download the first episode of the podcast. Other episodes (when available) can be downloaded by clicking the GET button against each one. 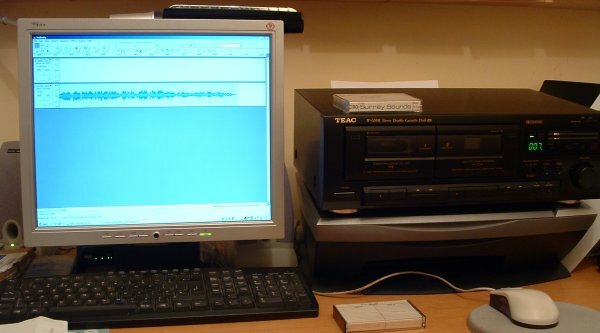 The off-air tapes were recorded to PC using a TEAC dual cassette deck and Audicity software.